Thank you, this is very comfortable eating place. Jypyä Pop (Turku, Finland) on 20 November 2013 in Animal & Insect and Portfolio. @ursulakatariina: This guy lives somewhere near here. It is a meal every day, many times. Aw!! This is absolutely cute...Love this endearing shot !!! To eat, he is ready to perform acrobatics. A very original position. A great shot, I like a lot. Nice shot, they must be in a hurry to build up their stores for winter. @Curly: You are right. Flowerbeds, and in all the appropriate places is caches. ah ah ... un régal pour lui et pour nous. Il est trop beau!! belle prise!! aww this is so cute ! HAHA! Upside down is adorable! This made me smile. @Frances: It is a natural situation. Eat the same food always have to fight. Such a place is the good thing that someone always brings more food. @The Mouse: I agree, and it is funny to look. Ha ha - definitely does not have a problem eating upside down. @kiwisa: Maybe not. I have not ever tried. What an interesting bird at the feeder! 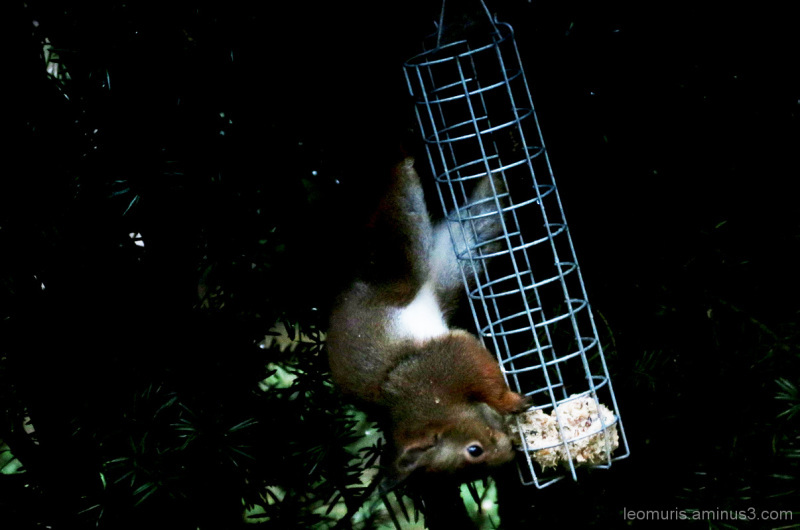 I have 'birds' just like this eating out of the bird feeders. They are just more grey than this cute red one. This squirrel looks healthy !! Does he have a name ?? A fine shot here Jypya Pop !! @John Jungklaus: Yes it is a very healthy looking and hard to eat. We are a humorous way to invite squirrels at Lassila. The name comes from one of the bank's advertisement in times past outbreaks of squirrel. Then it was the name of the Governor of the Bank of Lassila.